All VIA’s current ARM boards (VAB-600, 820, 1000) have an online mini-PCIe connector, and I’ve been planning to do something interesting with that for a long time (see this intro post from more than a year ago). Thus I’m very happy to introduce the PCIeDuino – mini-PCIe form-factor Arduino-compatible microcontroller, which can add a whole new set of I/O capabilities to these ARM “carrier boards”. I have just recently finished this board, and been able to test it briefly with Springboard and also with the VAB-820. The picture just below shows the shining blue LED, that is tied to D13 – the 13th digital pin, as most Arduinos do. Blinking LEDs are good to ascertain life, but electronics like this should do something more useful too! 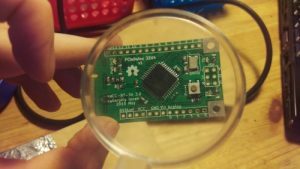 I have written about the PCIeDuino hardware in a lot more detail elsewhere; in a nutshell it is a remixed version of the Sparkfun Arduino Pro Micro 3.3V. It is built around an Atmel ATmega32U4 microcontroller, and breaks out all 13 digital I/O pins, 6 analog input pins, as well as PWM, Serial, I2C, SPI functionality. While Arduino boards can already be connected to any system that uses USB, this card has the advantage of being screwed onto the base board, so accidental disconnection is not possible. That should make PCIeDuino more reliable companion for embedded systems, where reliability trumps pretty much any other criteria. Now the likely next step is creating some demo use cases with the board; I’m just brewing up some interesting automation and industrial projects. If you have any suggestion what would you use an ARM board with an onboard Arduino, would love to hear! PCIeDuino is available on Tindie, the indie hardware marketplace. It’s open source hardware, released under the Creative Commons Attribution (CC-BY 3.0) license, just as the original Pro Micro was. The whole design was made with KiCad, and the design files are available on Github. Make your own mini-PCIe board! Still, I wanted to take this one step further. My first aim with the whole PCIeDuino project was to show how easy it is to make your own mini-PCIe hardware to extend the functionality of these VIA boards! Now that I see what did it really take to do just that, I have put together a small “base board” kit for mini-PCIe, so everyone could do their own compatible accessory as easily as possible. The base board kit is available on Github as a KiCad project (library, schematic, and PCB outline). I used KiCad because it’s also free and open source, to keep in the spirit of openness – and it’s a pretty good design tool as well in my experience. If you create any new boards, would be great to hear! If you have any questions, can leave it in the comment section below. And in the meantime, it’s another weekend coming up, another chance to hack on interesting hardware projects! Have fun, everyone!